Apple introduced the iPhone 10 years ago with much fanfare but little understanding at the time of the profound impact smartphone technology would have on our society. What started out as an interesting and fun piece of technology for the high-end, tech-savvy consumer turned into a must-have device for millions of consumers — both young and old, moderate income to wealthy. Since the iPhone’s original launch, Apple has sold more than 1.2 billion of these devices. Together, Google and Apple’s respective operating systems, Android and iOS, now control roughly 99 percent of the smartphone market, with 1.5 billion total units shipped worldwide in 2016 alone. Today, with the launch of voice-activated assistants, we are likely witnessing the next great consumer technology wave. The question now is will Amazon.com lead the way, delivering not only the technical platform with Alexa, but also the entire value chain, from order to fulfillment? In both grocery and foodservice, Amazon’s acquisition of Whole Foods is redefining the competitive landscape. Now with Google and Walmart hooking up, are we poised for unprecedented change in the food industry? Their mutual success may very well hinge on whether Google Home successfully battles Alexa for counter space in the kitchen. 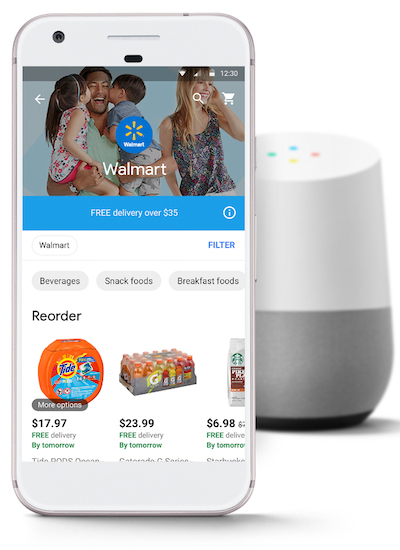 Walmart shoppers can now order groceries via the Google Home smart speaker, or on the Google Express website or mobile app. This digital transformation is real, and both the grocery and foodservice sectors will see dramatic change in the next three to five years, ushering in a new era of convenience and price transparency. To understand how this will shake out, you need to look at the key consumer groups that will drive this change, and an emerging capability that will drive loyalty: auto-replenishment. As consumers purchase more items online – including groceries – firms like Amazon will be able to discern household-level purchasing patterns and the frequency with which those purchases are made, leading to more precise recommendations. The day is rapidly approaching when consumers will be able to order an entire list of grocery items with a single voice command, or respond with a simple “yes” to a recommendation for a seasonal item based on the time of year and prior purchases. With things like auto-replenishment, the grouping of purchases at set time periods will completely change the convenience and impulse game, and drive greater brand loyalty for those that can deliver. A recent PWC study found that almost 40 percent of consumers “shop less often” at retail stores, due to Amazon.com. Other research points to the fact that consumers tend to be more loyal to stores than brands, so you can imagine consumer loyalty coalescing around “stores” such as Amazon – as well as Walmart, with assistance from Google. 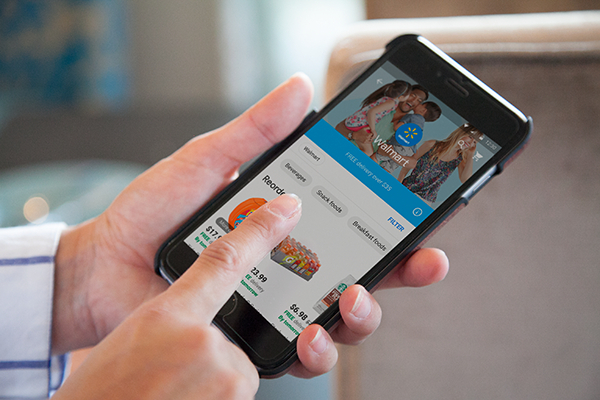 Loyalty programs in the past have primarily been about discounts, but in the future, they will be more about convenience and choice, driven by technology. And Amazon, thanks to Prime, already has a significant head start. There are now 80 million Prime subscribers in the United States, up from 58 million in 2016, and 75 percent of households with annual income of more than $112,000 are Prime subscribers. They spend almost double what non-Prime members spend ($1,300 per year versus $700) with Amazon. But this isn’t some Millennial-driven trend. Thirty-seven percent of Prime subscribers are more than 50 years old, and 62 percent are older than 40. It’s also not just about high-income households, as Prime adoption, according to Baird analyst Colin Sebastian, is now increasing the fastest among lower-income households. So, if capabilities like auto-replenish are the future, then where are consumers now? According to Nielsen, only 14 percent of those surveyed globally currently use an “automated online subscription service,” in which orders are replenished on a set schedule, but a full 54 percent indicated that they’re willing to do so in the future. When you break down the results by age group, you see a similar potential upside, particularly with Gen X and Baby Boomers. For Gen X, current use is 11 percent, but 56 percent indicated that they’re willing to use auto-replenishment in the future. For Boomers, the spread is equally impressive, with 6 percent currently using the service, and 40 percent willing to in the future. Aside from stated intent — which can be a somewhat unreliable indicator — we need to look at the characteristics of certain demographic groups that will likely drive greater adoption of online grocery purchases using voice-assistant technology and services like auto-replenishment. Digital-native Millennials: These tech-savvy online shoppers will continue to adopt new services and devices, and will lead the disruption of foodservice and grocery. Time-starved dual-income couples: Spanning age groups from Millennials to Gen X, these higher-earning couples are likely already Prime subscribers, love convenience and choice, and are comfortable with purchasing almost anything online. Older and less tech-savvy: With assistance from their Gen X children, the 65-year-old-plus age group will adopt voice assistants in greater numbers, enjoying convenience without the technical hassles. Home-bound population: The growing elderly and disabled population will take advantage of voice-assistant shopping, augmenting the support provided by social services and home health care workers. When combined, the above demographic groups constitute a significant portion of the U.S. population, with just Millennials and Boomers equaling roughly 150 million people. It’s clear that the retail industry in general, and grocery and foodservice in particular, is facing major changes driven by new and emerging digital threats. Incumbent players need to figure out how to stay relevant. What’s also clear is that status quo leadership just won’t cut it. Leaders need to quickly learn, adapt and move fast, or get passed by. Figuring out how to execute an omnichannel strategy that meets the rising expectations of today’s digital consumers, who expect convenience and low cost, is the strategic imperative. Leaders who can best manage change in their organizations will be able to seize opportunities as they emerge — and this will be the key differentiator. Simply put, big changes require bold, decisive leadership.